Well, I've finally been able to paint! Now the kids are back at school, it's time to get back into my 'groove' again, and get some work done. 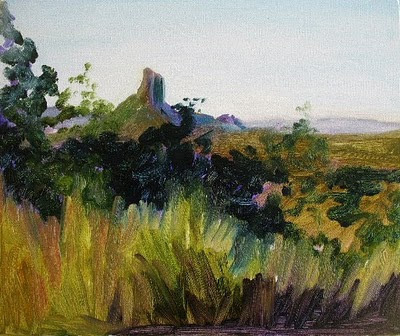 I decided to start off with a small landscape of the 'Glasshouse Mountains'. Thought it would be a nice little one to get me started. This is lovely Amanda. Love how you block in the under painting. Very beautiful, Amanda! You've done a great job!